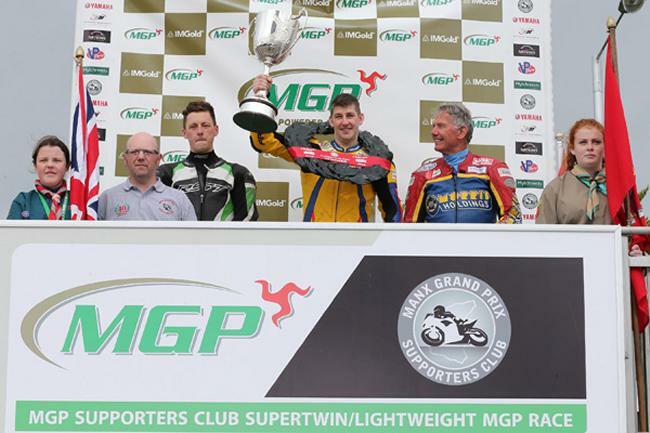 Wigan's Rob Hodson dominated today's MGP Supporters Club SuperTwin race, the opening race of the final day of the 2015 IMGold Manx Grand Prix. The JGH racer lead from the start to the chequered flag, setting a new lap and race record in the process for his first Mountain Course win but there was disappointment for Dave Taylor in the concurrent Lightweight race who was forced to retire when leading for the second consecutive year leaving newcomer Mark Purslow from Australia to take the win. Hodson set the pace on the opening lap shattering Phil McGurk's 2010 lap record with his opening lap of 114.550mph/ 19:45.750. He also set a new race record of 113.057/ 1:20.05.626 breaking Nigel Moore's 2012 time by over 2 minutes. 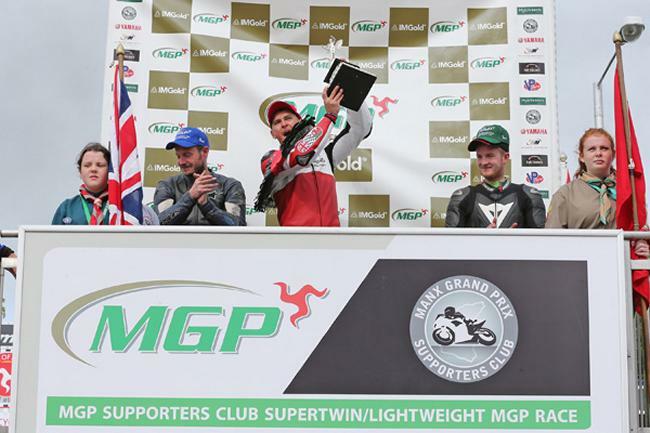 Manx rider Andrew Dudgeon followed Hodson home with Nick Jefferies, the 1993 Production TT Race winner, standing on the podium on the Isle of Man for the first time since the 1999 MGP Classic Senior Race, in third place. Ahead of the race, Clerk of the Course Phil Taubman described conditions as perfect and the SuperTwin and Lightweight race, which was delayed from Wednesday, got away as scheduled at 10.15. Hodson, who had already secured one podium this week with his third place in Wednesday's Junior Manx Grand Prix Race, was first away from the grandstand and he held an early advantage at Glen Helen, building a five second lead from fastest qualifier David Bell with Andrew Farrell a further five seconds back. Nick Jefferies, who made his Mountain Course debut in the 1975 TT Races, was fourth at the opening checkpoint. However, with David Bell reported to have stopped at Kerrowmoar, Hodson's lead was 24 seconds from new second placed man Nick Jefferies at Ramsey with Andrew Dudgeon moving into the top three. By the end of Hodson's record breaking opening lap, the race was already his to lose with a commanding lead of almost thirty seconds. Behind him Andrew Farrell had established a gap of four seconds from Jefferies. Fourth placed man Dudgeon and Derren Slous, who was in fifth, both came into the pits at the end of the first lap for a tactical 'splash and dash', hoping to gain an advantage with two flying laps. Hodson (113.919), Farrell (112.607) and Jefferies (111.715) all came into the pits at the end of their second lap with Hodson's lead at the front now over forty seconds. However, shortly after Farrell was reported as retiring at Quarterbridge with a lost fuel cap, leaving Dudgeon as his nearest rival. Dudgeon's third lap of 113.501 consolidated his second place, leading Jefferies (107.616/ 21:02.158) by almost forty seconds with Slous fourth (111.439/ 20:18.857) and Barry Furber (21:11.368/ 106.836) completing the top five. Slous's challenge was over on the last lap when the Manx rider was reported as having stopped at Ballaugh to make adjustments and though he got going again he dropped down the field. At the front Hodson didn't let up and a last lap of 114.218/ 19:49.196 gave him victory, in a new record time of 113.057/1:20.05.626, by over fifty seconds from Dudgeon (111.821/ 1:20.58.749) with Jefferies in third (110.768/ 1:21.44.963. The top three were all inside the old record. In the concurrent Lightweight race, the fastest two qualifiers, newcomer Mark Purslow and Scarborough's Nick Anderson, continued their battle with Anderson leading by a narrow margin of less than two seconds at Glen Helen from Purslow, who qualified fastest with a 105mph lap in Wednesday's session. The leading pair both went quicker than they had in qualifying with Anderson leading with 106.263/ 21:28.229 to Purslow's 106.175/ 21:19.280 with Dan Hobson third with his opening lap of 21:24.457. It was all change at the end of the second lap with Purslow, Anderson and Hobson all coming into the pits, leaving Dave Taylor as the new race leader at Glen Helen, 13 seconds ahead of Purslow with Anderson holding third. With speculation that Taylor could be trying to emulate Carolynn Sells in 2009 by running straight through, the Isle of Man based rider came into the pits at the end of the third lap but misfortune struck and his bike failed to fire putting him out of the race. Regardless of Taylor's problems, Purslow had already moved back into the lead and he duly held on to win with a last lap of 108.180 to take victory. Behind him Nick Anderson was reported to have retired at Snugborough on the last lap leaving Hobson to move into second with Alex Sinclair up in to third and that remained the top three at the chequered flag with Purslow time of 105.991/ 1:25.26.022 giving him victory by over twenty seconds from Hobson (015.542/ 1.25.47.847) with Sinclair (105.099/ 1:26.09.535 )clinching the final podium place.